Today is kind of a big day. I have a pitch at one of the major Hollywood studios. It’s a pretty exciting opportunity and could be a pretty fun gig. I’m not going to lie; I feel a few butterflies. It’s been about 5 years since I’ve been on a pitch. I’ve never been a huge fan of standing in a room full of people I don’t know convincing them of why we should work together. Kind of funny I work in advertising. I guess I just like convincing people of things from afar. 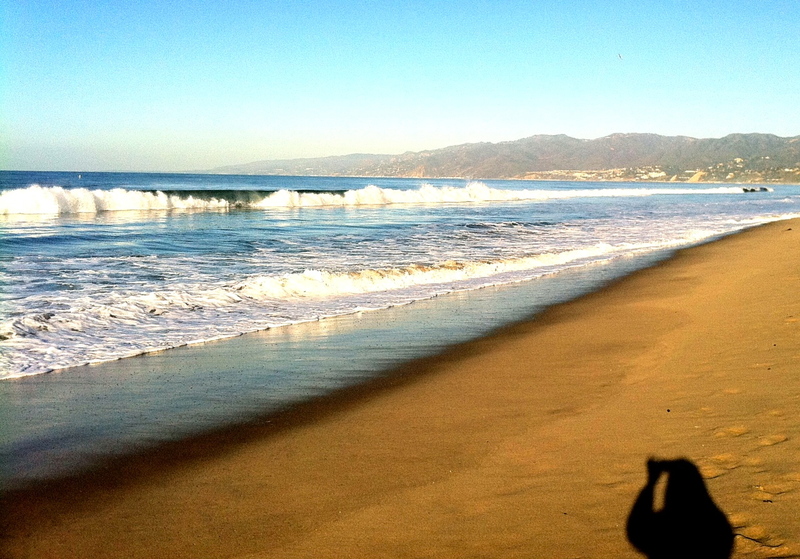 I decided it was a good morning to pay a visit to my favorite “yoga place”, the beach. It is the one thing I really miss living in Boulder. We used to live 2 blocks off the beach when we lived in LA, and it always helped balance the craziness. It always reminded me take deep breaths. My husband and I would try to make it a point to start our day with a walk together by the beach before work set in and took over. It was a good call this morning. It helped me bring my thoughts back to the excitement of the possibility of working together on something cool rather than worrying about “selling”. Yoga has been great this week at helping me redirect my thoughts that way. I will also be channeling one of my favorite account people I worked with at Arnold today, Will Burns. Will is one of those people who has an uncanny ability to get clients to remember how to be excited about what it is they do. He’s even ventured off on his own with an exciting new company based on the power of ideas called Ideasicle. When I worked with him in Boston, he always used to talk about the ” getting the universe to conspire on your behalf”. I always loved that. I’d say that’s a pretty yoga appropriate thought. Wish me luck, and let’s hope the universe conspires on my behalf. Good Luck! You will rock it girl. thanks chica. looking forward to hanging and baking some goodies next week! Aw, Darcie, that was nice. Best of luck to you. If your intentions are pure (and they always are, if I know you at all), then the universe will be a happy co-conspirator! In fact, I bet it’s already done its work. All you need to do is show up now. i too, believe that the universe conspires on our behalf when the idea is true and as will said, with pure intentions. good luck today. have no idea what you are working on but i’m sure it’s brilliant. aww…thanks jenny! will see how it goes! All my positive thoughts towards you! Sure you killed it! You are currently reading A visit to my favorite LA “yoga studio” at 52 To Do.